SC-Project started its activity in 2004 and it is a factory specialized in the production and design of high quality and performance exhaust system for motorcycles, both street and racing ones. The company is highly specialized in aftermarket exhaust system production and realizes full system and silencer using the best material as titanium, iconel and carbon fiber. It is also equipped with vanguard machineries which allow the factory to keep a very high qualitative standard. The new SC-Project headquarter is settled in viale Lombardia in Cassinetta di Lugagnano (MI), and is composed of 3 communicating buildings all characterized by an external area for a total surface of 16.000 m2: 9.000 m2 covered and 7.000 m2 open air. The productive and management head office is settled few kilometers far from Milan, in the industrial area between Abbiategrasso and Magenta: it is a strategic industrial area in the South West part of Milan, few kilometers from the A4 and A7 highways, which are reachable in less than 10 minutes by car. The metropolitan city of Milan is reachable in 30 minutes, Turin in an hour and the international airports of Malpensa and Linate are both reachable in 30 minutes. In a view of environment sustainability and use of sources of alternative energy, Advanced Group S.R.L. 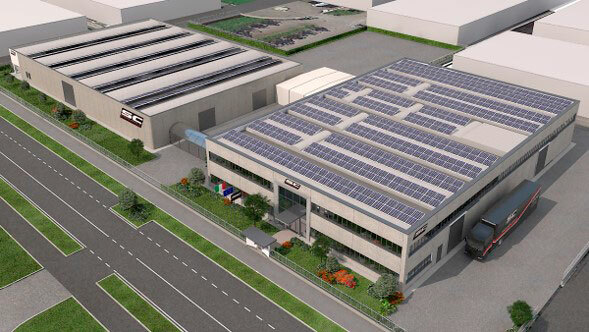 company, owner of SC-Project brand – has adopted a new and innovative photovoltaic system, which completely pays the energy consumption of the plant and completes the project of technological innovation about energy efficiency at 360°. The photovoltaic system is perfectly settled on the roof of the factory of Cassinetta di Lugagnano (MI), and produces energy to satisfy more than 100% of the energy needs of the whole production process of the company and it makes the company save dozen of TEP and avoids thousands and thousands CO2 kilos in the atmosphere. The photovoltaic project was strongly required by the company, which completely integrates in SC-Project policy for environment protection a sustainable development by the production of green energy, to improve the well-being of the territory and the community it is settled in, according to the company policy. Nowadays SC-Project produces more than 40.000 exhaust systems per year. This number improves year after year with a growth percentage of 35%. The production of street motorbikes exhaust systems split into: homologated exhaust systems for road use and racing systems for track usage. SC-Project company is officially credited and authorized by the Italian Ministry of Transport for the production of homologated exhaust systems, slip-on silencer or full exhaust system with catalyst. This homologation is valid throughout the EU. SC-Project exhaust systems are realized following the highest and severe qualitative standard and guarantee the respect of the European laws related to homologation of exhaust systems according to Regolamento (UE) 134/2014 as regards Euro 4 vehicles and according to Direttiva 2002/24/CE as regards Euro3 vehicles. Regarding homologation tests SC-Projects cooperate with the technical service of TUV SUD Auto Service GmbH which directly interfaces with the entity entrusted for homologation certificates to guarantee high standard of warranty, quality and safety for the end user. 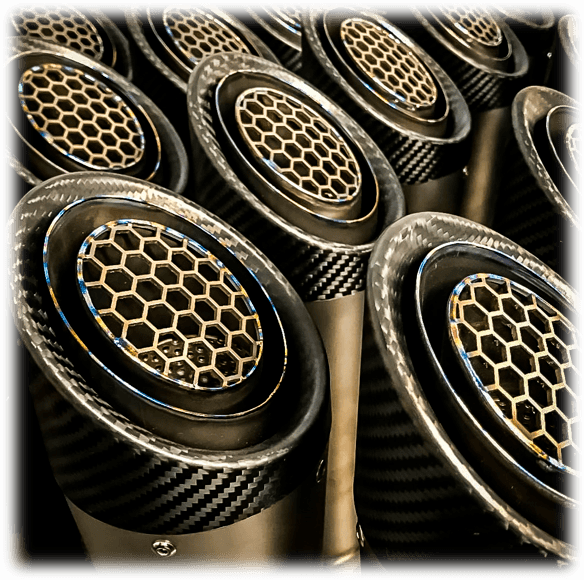 The development of race exhaust systems are directly followed by the internal SC-Project R&D department: performance tests are realized on the automotive dinamometers. SC-Project products are characterized by the high quality and excellence, result of continuous studies of the R&D department: SC-Project products identify as niche products which are exported worldwide. Research and quality represent strategic elements of the policy of company development and express through our internal R&D department, which works as real development station thanks to the cooperation and partnership with the Best Team, engineers and riders of MotoGP World Championship, world maximum expression of motorbike sector. 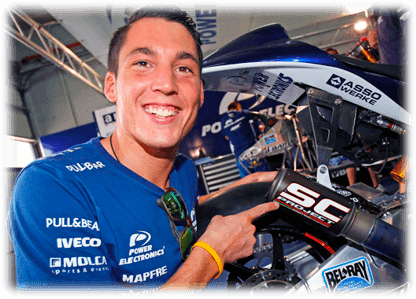 During 2013 season SC-Project became World Champion in CRT category with the rider Aleix Espargarò with Aspar MotoGP team: a very important title for its prestige and commercial level. It was the confirmation of the big potentiality of the exhaust systems of the Lombard factory SC-Project. Each silencer is projected, developed and realized by SC-Project engineers according to specific characteristics of the motorbike it is created for. The several varieties require the study of internal diameters, bend curves of exhaust gas, internal lengths, kind of sound absorbing and internal components used have to be diversified according to the motorbike and change according to the destination of the exhaust system usage. Exhaust systems are created for street motorbikes or race prototype, for two-cylinder engine or four-cylinder engine: in every case they guarantee performance of the highest level and a longer life endurance of the product. For this reason the R&D department, the feather in SC-Project cap, projects and develops each single component of the exhaust system and of the silencers through a project performed with sophisticated processes of photorealistic 3D rendering and then through mechanical design CAM 3D. Together with the technological and performing aspect, SC-Project focuses on the aesthetic aspect of every single product and creates a unique binomial between the bike and silencer which only a Made in Italy product can guarantee. SC-Project is a leader company in the motorbike exhaust systems and is strongly rooted in the race world, fundamental requirement to guarantee the final customer a qualitative and performance level at the top of the category. The commitment of SC-Project in the race world is very important and includes the maximum world championship: MotoGP, Superbike, Moto2, Moto3, Supersport and the major national speed championship – commitment directly followed on the race field. The collaboration with the best world team, together with the internal R&D department, allows SC-Project to propose an excellent product as regards material quality for finishes, planning, results on automotive dinamometers, both for professional bikers and private motor bikers. The race department is the beating heart of the company, real core of the activities of research and development of the products dedicated to races. In this part of the establishment Teams of the World Championship MotoGP, Moto2, Moto3, Superbike and Supersport alternates: for this reason the access to this area is allowed only to authorized personnel. The automotive dinamometers rooms are the noisiest of all the factory. They represent the arrival point of the job done by the engineers and it is possible to evaluate the result of what has been done in numerical terms. The automotive dinamometers room dedicated to racing products is – as the race department – forbidden to unauthorized people. On its automotive dinamometers the most spectacular prototypes and Race Replica deriving from series motorbikes alternate. The sound which resists to the sound absorber material is audible outside this room and it is the most magical thing a motorbike lover can hear. The results of the competitions watched on TV during the worldwide championship are the result of the job made on this automotive dinamometers. The automotive dinamometers room for street products is dedicated to the improvement for private customers motorbikes – both amateur riders and street riders. The collaboration between R&D and Race departments allows to have a product characterized by the highest performance with all homologation of street silencers. SC-Project company was born with a strong industrial and technological vocation, which breaks sector schemes with the creation of new products and leads to face new challenges and improve its know how to unify creative ideas and 100% Made in Italy project capability. A winning choose, which is the base of the international success. Technology represents a fundamental instrument to pursue a double aim. On one side it solves productive problems through experimentation of new materials and technologies in the continuous stretch to higher efficiency levels; on the other side it is a concrete benefit for the final customer, who can enjoyed results related to performance, quality and product lifespan. Technological vocation expresses also through the continuous updating of processes and systems and in the usage of strict procedures and techniques of industrialization and technologies resulting from prototypes which competes in MotoGP World Championship, where it is always necessary to be at top level. Several machineries are used by the company: CNC hydraulic bending pipes with numerical control for the curvature of collectors for motorbikes, calendars, automatic cutting of profiles, welding machines with TIG MIG technology for welding of steel, titanium and its alloys (also in protected atmosphere with argon gas), hydraulic press, plants for sandblasting and materials silking, YAG laser marking, lathes, calendars and shearing, molds and specific tools. Job force employed corresponds to 50 men: there are specialized technicians in motorbike sector such as collector and system designers, specific assemblers, welders with certificate, planners of components related to motorbikes. Product and quality improvement. The constant purchase of machinery and the supplying of raw materials of the highest quality let SC-Project brand have a constant growth of appreciation by the final customer. SC-Project places itself on the market as high quality brand, covering a very large number of customers at worldwide level in a high segment, which is always in search of high quality Made in Italy components. Continuous development of new products. The company is constantly addressed to the production of new products and material to launch on the market, proof investing in products and quality. The direct cooperation with manufacturers let the company have a preview of the motorbikes which will be introduced on the market, in order to produce an ad hoc product for a specific model and be ready to sell it as soon as the motorbike is sold to the customers, anticipating competitors. The material choice is fundamental for a company which aims to excellence. SC-Project uses for the creation of silencers light material of the highest quality as titanium, carbon fiber, AISI 304 stainless steel with reduced thickness (from 0,1mm to 0,6mm) joined to special sound absorbing cartridges with technical qualities of first orders. The sound absorbing cartridges, realized with texture fabric blend, guarantee a controlled noise reduction – especially at high frequency – keeping the characteristic full body sound of the racing world – true and real distinctive benchmark of each SC-Project exhaust system.